Click here if you are an administrator, and would like to know more about the settings regarding temporary replacements. In the menu at the top at ‘profile’, you can appoint a temporary replacement to take over your duties during temporary absence, for instance illness or vacation. Hover with your mouse over your name at the top and select ‘profile’ to view your user data. From the moment of selecting a replacement, all requests will be sent to him/her. You will not receive notifications of them anymore. 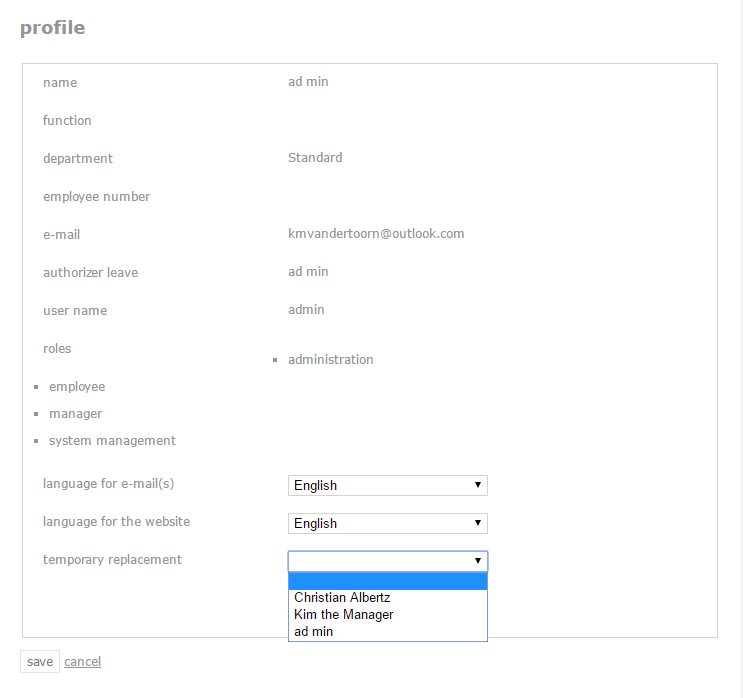 Should you still want to keep up to date about your employees, the Leavedays administrator at your company can change the settings so that you still receive emails about requests (via the edit employee screen, in the manager tab). Click here if you are an administrator, and would like to know more about these settings. As soon as you are back from your leave, this can be changed back in the same screens as the ones shown above.